Walk right in, sit right down and gaze at the magnificent 180 degree ocean view to San Nicolas Island, the Channel Islands & Malibu from the living, dining and master bedroom. 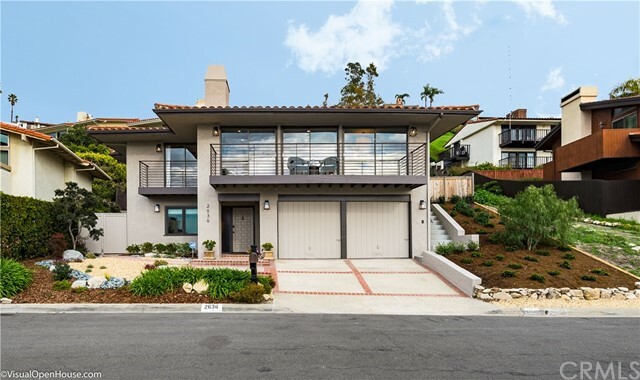 With full respect paid to the permit process this impeccably updated turnkey, site specific designed home is quietly situated in highly desirable Lunada Bay, adjacent to the Zumaya Path. Open floor plan and multiple patios are perfect for family gatherings and entertaining. The custom interior woodwork was built by a local police officer employing classic dovetail construction. Professionally designed landscape front and back with a large grassy area for playing, meditating or catching a spectacular ocean sunset. Control the temperature with the dreamy Warmly Yours radiant heat floor system or simply enjoy the warmth and ambiance from the two fireplaces in the living and family area. The uber oversized 2 car garage accommodates 4 automobiles with room for storage. With its utopian landscape, highly rated school system and ideal climate, Palos Verdes Estates was recently deemed the #1 city in California in which to live. There is more, so please click the features page to see all that this home has to offer. Truly a must see. Based on information from CARETS as of 4/18/2019 12:17 PM CST. The information being provided by CARETS is for the visitor's personal, noncommercial use and may not be used for any purpose other than to identify prospective properties visitor may be interested in purchasing. The data contained herein is copyrighted by CARETS, CLAW, CRISNet MLS, i-Tech MLS, PSRMLS and/or VCRDS and is protected by all applicable copyright laws. Any dissemination of this information is in violation of copyright laws and is strictly prohibited. Any property information referenced on this web site comes from the Internet Data Exchange (IDX) program of CARETS. This web site may reference real estate listing(s) held by a brokerage firm other than the broker and/or agent who owns this web site. The accuracy of all information, regardless of source, is deemed reliable but not guaranteed and should be personally verified through personal inspection by and/or with the appropriate professionals. IDX by Commissions Inc.